Bicycling is good for business in Orlando. Investing in bike lanes, bike racks and other types of bike infrastructure is also great for the job market. Bike-friendly projects have proven to create jobs – an estimated 11.4 jobs statewide per $1 million spent. In 2014, 655,000 jobs were created by the bicycling industry in Europe. That’s more than the United States’ Big Three automobile companies (Ford, General Motors, and Chrysler) combined (510,000 jobs). Furthermore, bikeable and walkable cities attract new employers. According to Smart Growth America, companies are more likely to relocate to cities that invest in bicyclist and pedestrian infrastructure. Just look at Edgewater Drive in College Park for a local example. The corridor has seen 77 new businesses open and 560 new jobs created since 2008. 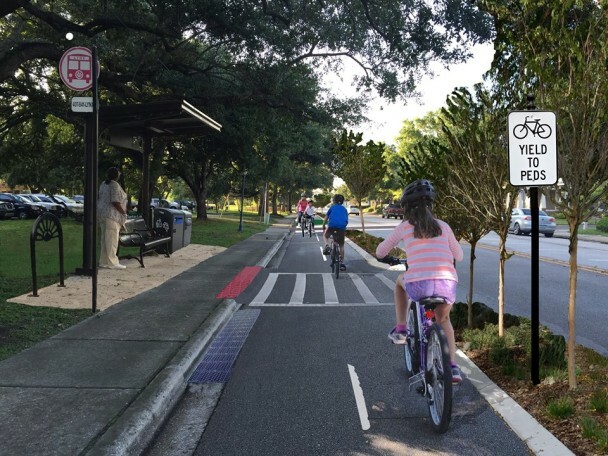 That’s when the City of Orlando created a more bicycle-and pedestrian-friendly atmosphere along this main street by adding bicycle lanes and wider on-street parking. Bottom line: investing in bicycle infrastructure = job creation.